Ira during field work at Clayoquot Sound, BC. A.A. (with distinction) Langara College, Vancouver, BC. B.Sc. (with honors), Natural Resources Conservation, University of British Columbia. Think about all the different ways that forests benefit you and me, and all other members of society. Within a forest, you might find a place to recreate, wild edible berries to eat, wood to use for home construction, and healthy streams full of spawning salmon. In the same forest, others might associate spiritual significance with certain tree species or they may derive a sense of wellbeing just from knowing that certain wildlife species dwell there. The different ways in which nature can benefit people are called ecosystem services. 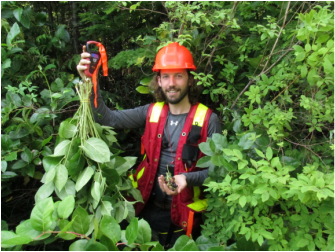 In my MSc, I study the recovery of multiple ecosystem services following logging at Vancouver Island, BC, Canada. My thesis is based on two quantitative chapters. In the first chapter, I estimate the long term recovery of a forest’s capacity to provide timber, carbon storage, edible berries, habitat for an endangered sea bird (marbled murrelet), and the large cedar used traditionally by First Nations at Vancouver Island, BC. I estimate the recovery trajectories of these ecosystem services over a 215 year period using generalized additive modelling based on data from a forest chronosequence. In the second chapter, I contrast the ecosystem services provided by second-growth and old-growth forests in two different ecosystems: a high-productivity riparian forest and a medium-productivity forest located on mountain slopes. I collected the data for the second chapter using field sampling in August 2014 at Clayoquot Sound (see this short film) with help from local First Nations. A key methodology I have developed and which I use in both chapters is the use of forest stand structural features (eg, trees, logs, understory plants and forest floor thickness) as biophysical indicators to estimate capacity of different ecosystem services. Beyond my thesis work, my interests in the theory and application of ecosystem services for environmental management are multifaceted. Specifically, I have research interests in these areas: 1) integrating ecological resilience theory and ecosystem services conceptual framework for environmental management, 2) conceptualizing regulating ecosystem services and how they interact to maintain the environmental quality of aquatic ecosystems, 3) assessing tradeoffs among urban forest ecosystem services caused by urban development, and 4) applying the approaches from historical ecology to examine temporal variation in forest ecosystem services. Lastly, I have interests in forests and the environment that go well beyond my research. For example, I often undertake adventures to visit big trees and explore wilderness areas. In 2012, I made a bicycle trip from Canada to Panama to explore forests, and I have done previous bike trips to Alaska and also across Canada. I enjoy communicating my passion for exploration and forest ecology via blogging, making films and doing public outreach: My personal blog is www.irasutherland.com, I have an online Vancouver big tree hiking guide and here are three of my short films which focus on the importance of forests: The Fir Hunter; Brothers Creek Ancient Forest, West Vancouver ; Montreal’s Hidden Giants: The immense cottonwoods of Parc la Fontaine. Check out a 1-minute video I made about my research here. Or a three minute here! Long-distance running, anything with bikes, climbing things, gardening, and writing.